Naturally, medical devices have a direct impact on the patient and because of this they must provide an intuitive user experience that is both considering and understanding of the user. However, this isn’t always the case and the empathetic element of the design is either lost or dismissed when it comes to the development of a new product. Aalto explores how a more harmonious patient experience can be achieved through the use of color, form and branding. Aalto is a self-injection device designed for use by patients suffering with a chronic disease that impacts their dexterity. The family of products that make-up Aalto each share the same geometric yet friendly forms that evoke a sense of trust. More significantly, they remove the stigma of medical devices and create a far more approachable product. This element of trust has been introduced to each aspect of the product, from the packaging through to the interface. By having these attributes projected onto each element, a far more considered and harmonized experience has been achieved. This is just a beautiful example of user-centered design. The Aalto autoinjector family uses robust, geometric forms to evoke a sense of TRUST. Bold use of midnight blue with a contrasting yellow accent colour and the use of a tactile outer skin portray the ACTIVE brand attribute. A sense of CALM is depicted in product detailing by using subtle ‘wave’ patterns on areas of the injectors. This indicates where (and how) patients should interact with the devices (twist, push and pull). Superfluous visual stimuli should be avoided, as it may detract from the device’s usability cues. The Aalto injector packaging is designed to provide an enhanced unboxing experience. When the pack is opened, the injector and instructions for use are presented to the patient simultaneously, reducing confusion and anxiety, and further enforcing the brand attributes of TRUST and CALM. Interactive and aesthetic harmony are considered with gesture control across hardware and software. The electromechanical autoinjector embodies this consideration. As a patient pushes the autoinjector against their skin, the digital interface and software responds to this physical interaction, guiding the user to push with and maintain the correct force. Visual impairment shouldn’t limit the individual’s ability to travel and experience new and exciting places, however, navigating unfamiliar environments can bring a set of significant challenges. This is the problem that Guide sets outs to solve… and it does so in a clever and stigma-free way! ‘Guide’ has been designed to provide the individual with assistance and convenience, and this starts with its self-driving ability. Four cameras accurately map the surrounding environment, allowing Guide to confidently and reliably accompany the user. The option for a more conventional method of wheeling the suitcase is also available. Guide relays information on the user’s surroundings via a braille bar located in the handle, this includes informing them of traffic lights as well as letting them know about potential obstacles! All of this and more has led to a device that carries an immense level of functionality, and it has the visuals to match! When we travel, the suitcase is always there for us. Also, visually impaired people always carry a walking stick. This smart suitcase, GUIDE, is designed to be a guide for the visually impaired by serving as a walking stick to identify the surroundings. Guide works on a self-driving basis. It has a gyro sensor, such as a single-passenger self-driving electric wheel, that centers on itself with two wheels and follows the visually impaired. Of course, if they don’t want a self-driving mode, they can use the handle to move it like a normal suitcase. The braille part, a key function of Guide, is located on the handle of the suitcase and provides information about the surrounding objects/environment with the thumb. Depending on the size of the hands of a blind user, the main bar can be selected, and then the braille direction, which is the same direction of the hand they use, can be selected to complete their own handles. The handle of the suitcase that contains Braille is completely detachable. Once the handle is detached, it can be extended for use as a walking stick. When the handle is used as a walking stick, the suitcase self-drives around the user and passes the main surrounding information to the Braille attached to the stick. Guide must observe the surroundings carefully on behalf of the visually impaired. Therefore, the cameras are located at the front, rear, and left and right ends of the suitcase to ensure not to miss an important situation. A total of four cameras accurately analyze the surroundings and guide the visually impaired through braille in real time. Fingerprint recognition makes it easier to unlock the suitcase. This easy-to-stow collapsible wheelchair also becomes a stretcher when needed. At the simple push of a button, the Emergency Wheelchair transforms from a small suitcase-sized box to a wheelchair. The backrest and leg rest can be further adjusted to turn into a stretcher that can be maneuvered around using the small wheels at the base. Designed for every conceivable scenario and engineered to make sure it effectively works in all conditions, the wheelchair is made of a magnesium alloy, high-strength factory plastic, and a flame retardant fabric. When not in use, it collapses back to the size of a suitcase, allowing it to be easily packed and stored back in its place. The Emergency Wheelchair is a winner of the Red Dot Design Concept Award for the year 2018. Designers: Chen Zhigang, Fan Xin, Hu Shiya, Liu Qiangjia & Zhou Chao. Designed to combat the lack of proper tools and expertise when it comes to measuring eye power in low-resource areas, the Folding Foropter is a pretty nifty, low-cost paper device that helps anyone measure their eye power without needing an expensive setup or expert assistance. The Folding Foropter uses two paper tubes and lenses to replicate the complex eye tests done by optometrists, but simplifies it to a great degree, helping bring the gift of corrective vision to the billions who require it but don’t have access to the resources. Developed by the LVPEI Center of Innovation in India, the Foropter is simple to make and even simpler to use. A sliding telescopic layout allows two lenses to slide towards or away from each other, while you, the user try to find the lens position at which your vision is the clearest. A gauge on the side tells you what your eye power is with an accuracy of ±1 dioptre. The Folding Foropter’s easy to ship (it flat-packs), easy to assemble and easy to use design helps bring corrective vision to the 2.3 billion people who need it. Plus, with its colorful design, it helps gamify a process that feels slightly daunting with heavy eyegear and hard-to-read charts too! How does an ambulance reach a victim in a road/highway accident when there are more than a dozen cars stuck in a traffic jam between the ambulance and the site of the accident? Up until now the only solution was to drive in the opposite lane, weaving through oncoming traffic to get to the victim. 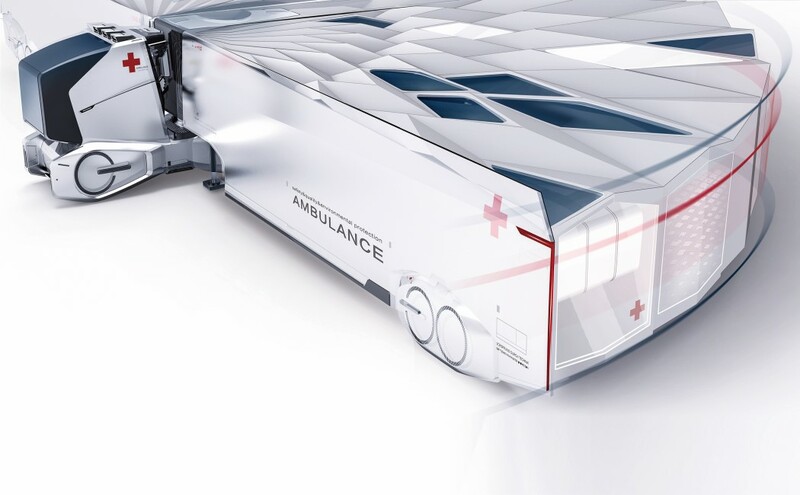 A band of Korean designers created the Median AMB, a special ambulance that can directly reach the point of the accident without getting affected by the traffic congestion created by the accident. The Median AMB sits on the road divider/median and drives up and down the highway almost like a monorail. 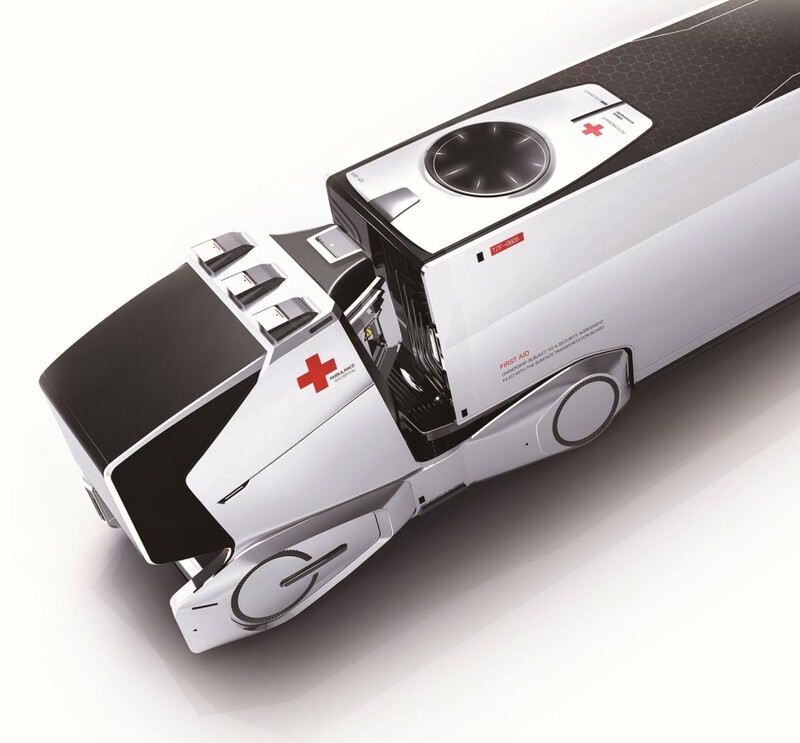 It features sliding doors on both sides, seating for a driver and an assistant, and an area for a stretcher that holds the victim. The Median AMB drives down the dividers, right to the victim’s location, picks them up and brings them to a proper ambulance that can take the victim to the nearest hospital. The Median AMB is a winner of the Red Dot Design Concept Award for the year 2018. Think about it. When you deploy an ambulance, you’re essentially making two trips. One, to the patient, and the second, to the hospital after collecting the patient. This 2x journey is often the difference between life and death, and a problem that the Life Knight wants to solve. 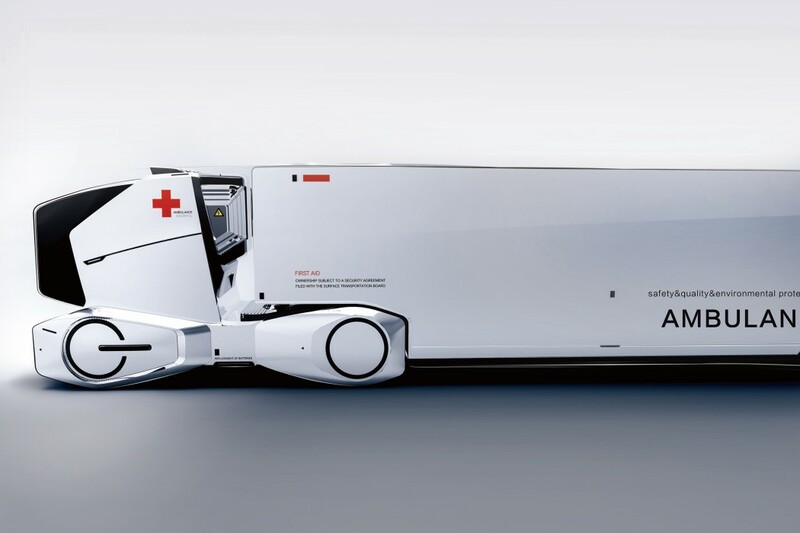 Designed to be deployed in areas with no access to medical care, i.e., disaster-struck zones or medically underdeveloped areas, the Life Knight is a moving hospital that reaches its destination and opens up into a full-fledged emergency room that can cater to more than one patient. Its body can be expanded—an inner crane structure extends outwards to create a makeshift hospital with 26 wards and an operating room fully equipped to meet the basic needs for treating mild to moderate injuries. 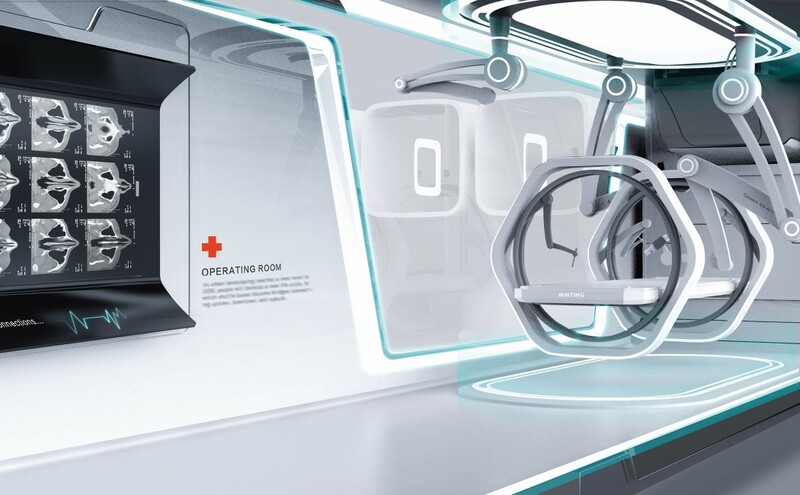 Instead of driving patients to the hospital and wasting crucial time, the Life Knight brings the facilities of the hospital directly to its patients, halving the treatment time, and saving a lot of lives. The Life Knight is a winner of the Red Dot Design Concept Award for the year 2019. Screens are unavoidable. No matter where you go, you’re almost always going to be confronted by a wall of pixels, and even when you’re not, there’s always a screen in your pocket, always ready to display hours of content for you. It’s no secret that screens are also bad for you over long periods of time (I get the irony of writing this on a screen for you to read from), causing sleep deprivation, grogginess, and even eye dryness over long periods of time. While most solutions like blue-light filters just partially solve the problem, the people at Umay Care may have come up with a better solution. 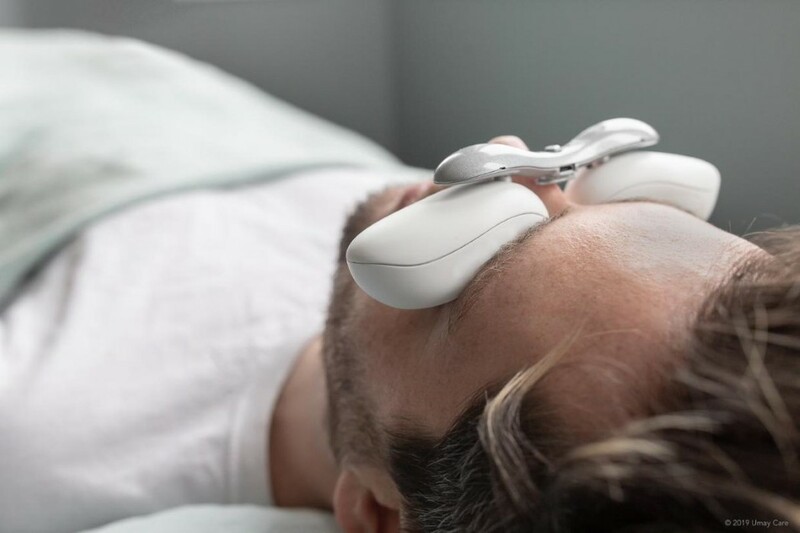 Umay Care’s premier product is an eye-mask that looks like it was designed by Luigi Colani. 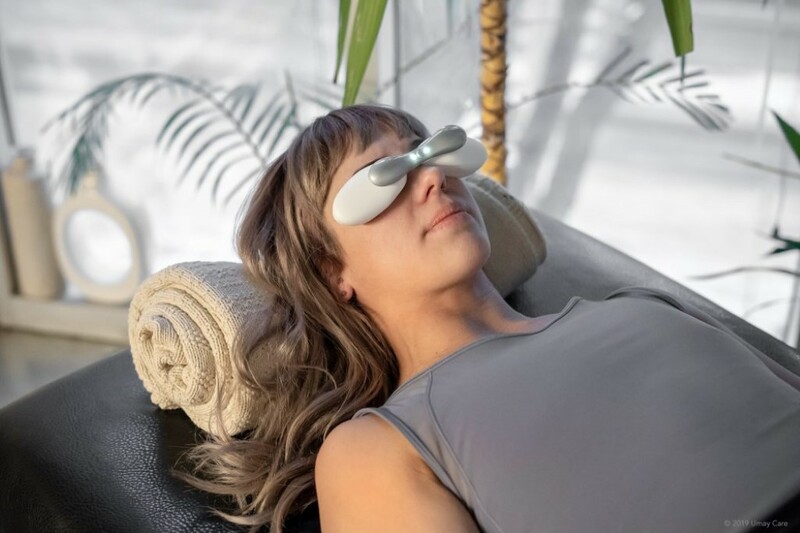 Titled the Umay Rest, this rather fluid looking eye-mask helps rejuvenate your eyes through thermotechnology, reversing the effects of prolonged screen time. “Every time we blink, a small trace of oil is released into our eyes. When we blink less while staring at a screen, this natural process doesn’t happen as often, leaving our eyes dry and irritated.” The Umay Rest applies specific, calibrated doses of warmth to the eyes, helping in activating these oils. 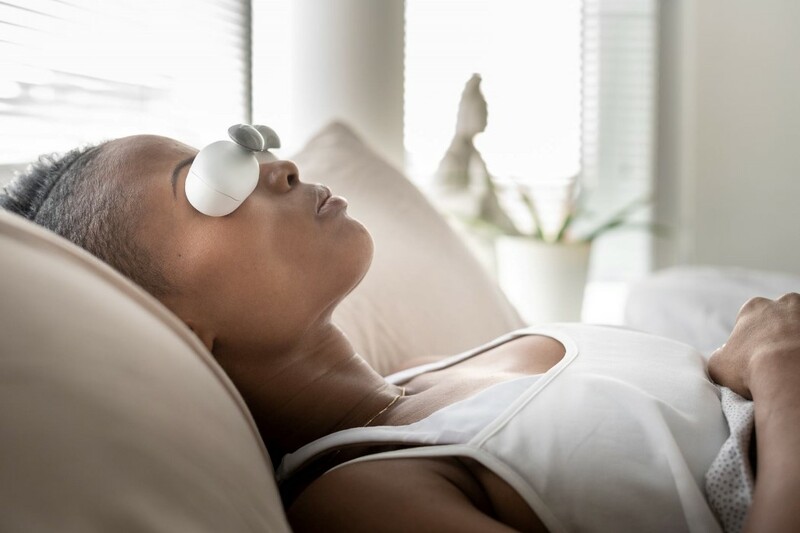 Designed for more than just relieving dry eyes, the Umay Rest can also cool down your eyelids, imparting an instant sense of relaxation and reducing eye puffiness from lack of proper rest, and even uses gentle vibrations and guided meditations to help bring down overall stress levels. Besides, just wearing the eye-mask would mean getting a break from staring at the screen and giving your eyes some much-deserved rest.